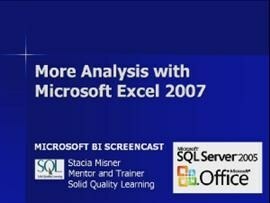 This screencast is the first in a series BI Developer screencasts recorded as part of a workshop built on SQL Server 2005 that have been delivered around the globe by Microsoft and Microsoft Partners. This training event takes the student through the Microsoft BI Platform giving a BI Developer the introduction and basic comfort needed to tackle a BI project using Microsoft technology. If you missed the first screencast in this series I highly recommend that you watch it first as it provides a great overview of Microsoft BI technology. 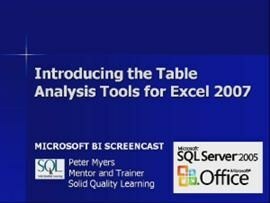 Additional screencasts will be published under the "SQL+Server" so subscribe to it now! We are really interested in your feedback on Introducing Data Mining. Feel free to leave a comment here or reply privately. There is apparently an issue with the way these videos are encoded and Silverlight player... You can watch these videos by clicking on the "Downloads" link then selecting "WMV". I'll see what I can do to get this fixed. Sorry for the inconvenience.